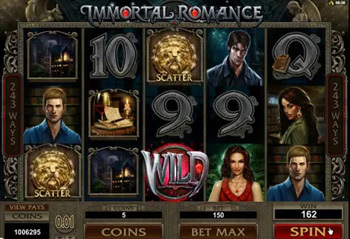 Microgaming and Platinum Play are set to inject a dose of vampiric charm into the slot gaming scene soon, as they prepare to launch Immortal Romance on 5 December. Immortal Romance’s arrival comes off the back of a busy summer for Platinum Play, and is being billed as Microgaming’s biggest game of the year. a top jackpot of 3,645,000 coins. As an added incentive, Platinum Play has announced it will be offering triple loyalty reward points (which can be redeemed for cash) for Immortal Romance throughout December. So regardless of their win/loss status, early adopters should see their willingness to embrace the game suitably rewarded. However, it’s not only the gameplay and prizes that are likely to impress players, as a lot of effort has gone into Immortal Romance’s presentation and story. Drawing inspiration from the likes of the Twilight movies, the story revolves around four underworldly characters whose destinies are intertwined in a story of lust, love, fear and loathing, played out against the backdrop of some lavishly styled visuals and a haunting soundtrack. With Microgaming keen for it to be held in the same high esteem as its Thunderstruck series, Immortal Romance is currently the subject of an aggressive online marketing campaign. Alongside a strong presence on YouTube and a dedicated Facebook page, Microgaming has launched a high-end website, immortalromance.com, to promote the game. This features narrated background stories for each of its protagonists, mini-games, ringtones, wallpapers and a downloadable soundtrack. And with the game set to cater for most budgets (with individual bet amounts ranging from 0.30 to 6.00), Immortal Romance looks like it should be well worth a look when it launches on 5 December.